The most famous Vettakkorumakan temple is the Balussery Vettakkorumakan temple.Balussery Vettackorumakan Kavu is situated east of Quilandy twenty five kilometers from Kozhikode ( Calicut) via karappampu - kakkodi. Among all the ancient and unique temples of South India, Vaikom Mahadevar Temple of Kerala, South India occupies the most significant position in the whole world. Agasteeshwara Temple is the shrine of Lord Shiva located on the banks of river Cauvery at Tirumakudalu Narasipura in the district of Mysore, Karnataka. As per the legends, the deity in the temple is said to have been installed by sage Agastya. Ajgaivinath temple in sultanganj is dedicated to lord shiva.the origin of Ajgaivinath temple at Jahangira or Sultanganj is not exactly known. Some claim it to be a Swayambhu, on the rock, discovered and then given an abode. Akshardham Temple in Delhi has an important place in Delhis tourism. The structure depicts great Indian culture and its architecture is simply immaculate. The temple is located at NH 24, Noida Mor, New Delhi. Ambaji maa temple is a temple of the mother Goddess Amba mata. Ambaji maa temple is one of holiest and a major shakti peeth of India. It is located at a distance of approximately 65 Kms from Palanpur and 45 Kms from Mount Abu near the Gujarat and Rajasthan border. Ambalapuzha, the Land of Lord Krishna is the most gifted tourist and pilgrim center in Kerala. The main attraction is Ambalapuzha Sree Krishna swami temple. In olden days Ambalapuzha was known as Chempakassery. Sri Anantha Padmanabhaswamy Temple is located in the heart of Thiruvananthapuram city of Kerala State, South India. This famous temple is dedicated to Lord Vishnu. Ananthpura Lake temple is the only lake temple in Kerala and is the moolasthanam (original abode) of Anandapadmanabha, the deity of Sree Padmanabha Swami Temple, Thiruvananthapuram. The Ananthasana (Ananteswara) Temple, located in the middle of the temple square, is a temple dedicated to Lord Siva and Lord Vishnu. Aranya Devi temple is dedicated to goddess Aranya Devi-the goddess of the forest. Aranya devi temple is located at arrah near patna. Arunachaleshwar temple at Thiruvanamallai is one of the biggest and grandest Shaivite temple in South India.Annamalai Temple the famous shrine of Tamilnadu, home of Lord Siva called Arunachaleswar . Aundha Nagnath temple in maharashtra is one among the 12 Jyotirlingas temple of India. Among the 12 Jyotirlingas, 5 lie in Maharashtra. Aundha Nagnath is considered to be the first Jyotirlinga where Shiva is worshipped. Fortyone days of penance during the Mandalam period and the journey to Sabarimala to have darshan of Lord Ayyappa really transforms the life a devotee. One of the most ancient temples in Mumbai, Lord Shiva in the form of a Babul tree is the presiding deity of the Babulnath temple. Situated at the end of Marine Drive and South of Malabar Hill, the temple of babulnath is nearly 1000 feet above the sea level, overlooking the Arabian Sea. Bagnath temple is situated in the centre of bagnath town at the confluence of the rivers Sarayu and Gomti and is dedicated to Lord Shiva.The temple of Bagnath is venerated by one and all. Vaidyanath Temple, also called Vaijnath Temple and Baidyanth Temple is located at Deogarh in the Santal Parganas region of Bihar in the south west of Keeul Station. Ashtavinayaka or eight Ganeshas is located in Maharashtra state of India, The Ashtavinayaka yatra or pilgrimage tour covers the eight holy temples of lord Ganesha which are situated around Pune. One of the most important and vibrant temples in Vrindavan is the Bankey Bihari Temple. The Bankey Bihari Temple houses a sacred image of Lord Krishna known as Thakkur Ji, which shows Krishna with an almost blackened body. Bari Patan Devi Temple is a magnificent shrine located in Patna, Bihar. The temple enshrines the black stone idols of Goddess Kali, Goddess Lakshmi, Goddess Saraswati and Bhairav in a standing posture. The Bhagawati temple at Kodungallur is of great renown throughout the state of Kerala. It is quite interesting to learn bhagwati temple of goddess Kali was dedicated to Lord Siva in the beginning, and later a majestic six - foot high wooden image of Kali facing the north was installed. The remarkable aspect of the Bhagwati temple at Chengannur is that the phenomenon of the goddess getting her periods still continues though the deity is cast in the five metals(panchaloha). The Tulja Bhavani Mandir is one of the 51 Shakti Pithas in maharashtra, India and is located in an aesthetic ambiance in Tuljapur. Tulja Bhavani temple was constructed during the 12th Century. Bhimashankar in Maharashtra is an ancient shrine, enshrining Bhimashankara one of the 12 Jyotirlingas of Shiva. The Temple is a composite of old and the new structures and is built in the Nagara style of architecture. Bhojeshwar temple stands on the right bank of river Betwa, 26 kms on south-east of Bhopal city. This unique bhojeswar shiva temple is incomplete due to some unkown reasons. It is ascribed to legendary King Bhojadeva of Parmara dynasty who ruled the region from 1010 A.D. to 1055 A.D.
Biligiri Ranganna Temple mysore is beautifully placed on the top of a rock face and the stone pillars have beautiful messages carved that are associated with ancient facts. Kaladi is quiet little village, the birth place of great Sage Sri Sankarachrya, the great Indian Philosopher who lived in the 8th century, lies on the bank of Periyar river. Brahma Temple is the most important of all the temples at Pushkar and one of the very few Brahma temples in existence in India. The Brajeshwari Devi temple kangara,located in the old Kangra township, is said to have been built over the charred breasts of Sati. Once renowned for it's great wealth, over the ages it has been plundered relentlessly. Bramheswara Temple at bhubaneshwar is a tribute to the mature Oriyan school of architecture, this beautiful temple houses a living deity, which is indicated by the saffron pennant flying from the top of the sanctuary. The Bull temple of Bangalore is dedicated to Nandi Bull, the vahana (vehicle) of Lord Shiva. Situated in Basavanagudi, this temple has been built in the Dravidian style of architecture. Overlooking the mighty Dhauldhar ranges, the Chamunda Devi Temple is situated on the bank of river Ban Ganga, at 1000m above sea-level. Located at about 15 kms from Dharamshala, this ancient temple is 700 years old. Chamundeshwari Temple is the Abode of the presiding deity of Mysore Goddess Chamundeshwari. The Devi shrine is situated on top of Chamundi Hill, originally known as Mahabalagiri, at an altitude 1073 feet, commanding a panoramic view of the city below. Located atop Neel Parvat, Chandidevi temple is one of the most ancient temples of north India. This is a Sidhapeeth (holy places where ones wishes are fulfilled). Chandidevi alongwith Mansadevi and Mayadevi temple form a Siddhapeeth triangle in the holy city of Hardwar. Sri Candramauleswara Temple is directly across the street from the udupi Krishna Temple. Lord Shiva has the name of chandramauleswara because he carries a crescent moon (candra) on his head. Chhatarpur Temple is located on Gurgaon-Mehrauli Road, in South Delhi. The temple is easily accessible by buses, autos, metro and taxis from the city. This marvelous temple is accredited for being the second largest temple of India. Melkote is a popular center of pilgrimage center and has two different temples. The main temple is a square building of large size but very plain is dedicated to Lord Cheluva Narayana Swamy or Tirunarayana. Chennakeshava temple is an excellent example of Hoysala architecture. Chennakeshava temple is named after the beautiful (chenna) long-haired (keshava) form of Lord Krishna. Chintanman ganesh temple is highly revered and one of the most visited shrines of Ujjain in Madhya Pradesh. Chintamani Ganesha Mandir is wholly made out in stone. It is believed that the temple was built during the reign of Paramaras in Madhya Pradesh (Malwa). Ashtavinayaka or eight Ganeshas is located in Maharashtra state of India, The Ashtavinayaka yatra or pilgrimage tour covers the eight holy temples of Ganesha which are situated around Pune. The Chintpurni temple stands on the spot where the charred feet of Sati fell. Her feet are symbolised by the 'pindi' or the stone hall. The Chintpurni 'mantra' is very popular with devotees. Chottanikkara Bhagavathy Temple is the most important Temple among the 393 shrines spread over 3 Districts of Kerala.The Divine Mother known as Rajarajeswari (Adiparasakthi) is worshipped here in three forms Saraswathy in the morning, Lakshmi at noon and Durga in the evening. Srimanth Dagaduseth Ganpati temple pune is one of the most important and visited ganesh temple in Maharashtra. Dagaduseth seth ganpati temple is visited by millions of people on ganesh chaturthi and the ten day festival celebration of Ganesh chaturthi. Datta mandir temple of Pune is known as Dagdu Halwai Datta Mandir. Devotees residing in Pune and around often visit this temple and offer their prayers. Everyday, Poojas are performed twice. On Thursdays, several special poojas are performed which attract a great number of people. Devi Bhramarambika, temple srisailam looks like a large fort and is known for its wealth of sculptures. There are rows of sculptures on the walls, giving one the impression of a gallery. The abode of Devi Kanaka Durga temple, goddess of power, riches and benevolence, is the presiding deity of the city of Vijayawada .Kanaka Durga temple is set on the Indrakiladri hill. Devi Mookambika temple is an ancient temple located at Kollur in Karnataka. Kollur is about 135 away from Mangalore. And is easily accessed from Tamilnadu, Kerala and Karnataka by train and road. Katil is 80 kms from Kundapur, on the banks of the river Nandini. It has a famous temple dedicated to Durga Parameshwari. Pilgrims enter the sanctum through the Dwajasthamba Mandapa. Dwarkadish is another name of Lord Krishna that means the 'Lord of Dwarka'. The five-storey high temple is built on seventy-two pillars. The temple spire is 78.3m (235 feet) high. Eklingji (lord Shiva) temple is said to be the guardian deity of Mewar. This deity was regarded as the virtual ruler, by the Maharajas of Mewar - who considered themselves to be regents (Dewans) under Eklingji. Ernakulathappan Temple is situated in the heart of Ernakulam City with lord Shiva as deity. This is one of the rarest Shiva temples where deity is facing sea towards west. Gokula is where Krishna lived until He was seven years old. The pastimes of Damodar, the stealing of butter, and other childhood pastimes took place here. The temple to Gomateswara in Sravanbelagola is built on top of a hill, in between two hills - at a height of 3000 feet above sea level. A flight of 500 steps provides access to this temple. Govindaraja Perumal Temple, Tirupati there are two main shrines in the northern shrine is Sri Govindaraja, who is Lord Vishnu lying on Ananta. He is considered to be Lord Venkateswara's brother. Brindavan of Guru Raghahavendraswami Mantralayam is the abode of Guru Raghavendraswami, an eminent pontiff of the Dwaita philosophy enunciated by Shri Madhwacharya. Hanseswari Temple at Bansberia near Kolkata (Calcutta) in West Bengal .The main deity is the blue neem-wood idol of the four-armed goddess Hanseswari, a manifestation of Goddess Kali.The temple is 21 m high and has 13 towers. The peak of each tower is shaped as a lotus flower. The temple of Harihar Nath in Sonepur is believed to have been originally built by Lord Ram, the famous prince of Ayodhya, on his way to the court of King Janak to win the hand of Mata Sita. The Hoysaleswara temple was built by Ketamalla, a minister of King Vishnuvardhana in the 12th Century. Hoysaleswara Temple is one amongst the largest shrines that are dedicated to Lord Shiva in South India. ISKCON Temple is located at Hari Krishna Hill, in the East of Kailash area of New Delhi. It was built as recently as 1998 and is one of the most lavish and grand temples of the city. Ryali is situated in East Godavari district (Atreyapuram Mandalam) of Andhrapradesh - India. This area is also called Kona Seema, a purely well irrigated area of Andhrapradesh due to many tributories of river Godavari. Jaganmohana Ranganatha Temple, located at Talakadu, is a major temple in Mysore. It is a beautiful temple which comes under the category of Madhya Rangam. Dedicated to Lord Vishnu, the temple attracts large number of devotees. They worship Lord Vishnu as Jaganmohana Ranganatha. Jain temple Purulia has a number of Jain images, some of which are clearly those of the Jain Tirthankaras. An inscription on a stone fixed to a pillar found at this village was removed decades back and was fixed by the roadside within the court compound at Purulia. The Sree Janardana Swamy Temple at Varkala which attracts a great number of devotees from all over the country. Sree Janardana Swamy Temple is located about two km. west of Varkala railway station (on the Trivandrum-Quilon line) atop a hill on the coast. The Jwalamukhi Temple, 30 km from Kangra, has an eternally burning blue flame that comes from the rock sanctum. Perched on a ridge called Kali dhar is the Jwalamukhi temple. The temple of Manjunatheshwara on the hills of Kadri is a very beautiful and popular temple in Mangalore. It is said to be built during the 10th or 11th century. It was converted to a complete stone structure during the 14th century. Kali Bari Mandir delhi is dedicated to Goddess Kali. It is relatively small in size and quite unpretentious in its design. Kalighat Kali Temple in Kolkatta is regarded as the holiest peeth or pith of the 52 Shakti Peethams of India, where the various parts of Sati's body are said to have fallen, in the course of Shiva's Rudra Tandava. Kamakhya Temple, which is situated at the top of the Nilachal Hill at about 800 feet above the sea level. Apart from the main devi temple, it also comprises of some other major temples of devi Kali, Tara, Bagala, Chinnamasta, Bhuvanesvari, Bhairavi and Dhumavati. Kapil Muni Temple is situated at Sagar Island in West Bengal. It is believed that the deity was installed in 1437 by Swami Ramanand. The current structure is a recent one and it has a stone block, considered to be the representation of Sage Kapil. Kashi Vishwanath Jyotirlinga Temple is situated at Kashi (Banaras) and famous by the name of Shiv Vishwanath Kashi. Keerthi Narayana temple in talakkad is one of the Pancha Narayana (lord Vishnu) shrines built in the year 1117 AD by King Vishnuvardhana around the same time, as ordained by the Lord. Keshava temple somnathpur near mysore is situated on the banks of river Cauvery. The Hoysala temple of Lord Keshava, built in the 12th century, is known for its sculptural beauty. Jejuri is one the popular pilgrim centres of Maharashtra, located 38-km from Pune and 60-km from Sholapur. Jejuri houses a temple dedicated to Lord Khandoba. The town of Anegundi, about 5 km from Hampi, is situated on the north bank of the Tungabhadra River. Local people believe that this is the ancient place known as Kishkindha, where lord Rama met Sugriva and Hanuman. The Udupi Krishna Temple is commonly known as Krishna Mutt dedicated to lord krishna is located in the heart of udupi. Shree Krishna Temple Udipi is first among the seven places of pilgrimages. The Kukke Subramanya Temple is located in the village of Subramanya, dedicated to Lord Subramanya, the Son of Lord Shiva. Kumaranalloor Sree Bhagavathy ( Karthyayani Devi ) is considered as one of the most important devi temples among the 108 durgalayas (devi temples) in Kerala. The Lalji temple Bishnupur, dedicated to Sri Radhika and Sri Krishna , which stands on a high point, is of the Bengali style of architecture. Lingaraj temple in bhubaneshwar is one of the most popular temples of Orissa. Lingaraj temple is dedicated to Lord Shiva, also known as ‘Lingaraj' or harihara. This magnificent temple is a testimony to Indian architecture at its most mature and fully developed state. Lord Malleshwara Temple in Vijayawada is one of the important temples in the state of andhra pradesh.Lord Shiva in the form of Linga is the presiding deity of Lord Malleshwara Temple - Vijayawada. Lotus Temple is one of the remarkable architectures of Bahai faith. Lotus Temple is located at Kalkaji in New Delhi. Lotus temple looks like a lotus flower and is made of marble, cement, dolomite and sand. The Madan Mohan Temple vrindavan is located near the Kali Ghat.Of all the Holy Places in Vrindavan, the Madan Mohan Temple is one of those most revered because it has the distinction of being the oldest temple in Vrindavan. Shree Mahaballeswara Temple, Gokarna is a sacred pilgrimage site located at the western coast of India, Uttara Kannada district of Karnataka . Mahaballeswara Shiva temple is said to be next in sanctity only to the Vishwanath Siva Temple in Varanasi. The Mahabodhi (Great Enlightenment) Temple is a Buddhist stupa located in Bodhgaya, India. Mahabodhi temple is the most sacred site in Buddhism and visited regularly by both Buddhist and Hindu pilgrims (many Hindus honor the Buddha as an incarnation of Vishnu). Mahadeshwara Shiva temple is situated atop a hill, known as Mahadeshwara Hills (MM Hills), closer to Mysore. 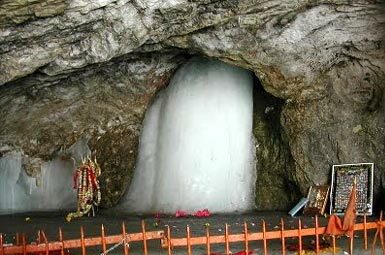 Pilgrims come here for a holy dip in Antaragange, a perennial source of water, and have darshan of the Lord shiva. The Mahakaleshwar temple at Ujjain is One of the 12 Jyotirlingas in India, the lingam at the Mahakal is believed to be swayambhu (born of itself), deriving currents of power (Shakti) from within itself as against the other images and lingams which are ritually established and invested with mantra-shakti. The Shri Mahalakshmi Temple of Kolhapur is one of the Shakti peetha located in Maharashtra. The various puranas of ancient India, have listed 108 shaktipeethas where Shakti (the goddess of power) is manifested. Amongst these Shri Mahalakshmi of the Karveer area (the area where the present town of Kolhapur is located), is of special significance. Mahanandi is a beautiful temple town and the existence of the famous Mahanandishwara Temple, with presiding deity of Lord Siva, makes this place religiously significant. Lord Mahaveer temple is located at Vaishali village about 35 kilometeres away from by-road from Muzaffarpur to Hazipur railway stations in Bihar. According to Digambara sect Lord Mahaveer was born at this place. The temple of Lord Mallikarjuna is situated in the state of Andhra Pradesh. Lord Mallikarjuna temple is situated in the town of Srisailam on the banks of River Patalganga Krishna. Srisailam mountain is looked upon reverentially as the Kailash of South . Sri Manakula Vinayakar Temple is situated at the heart of Puducherry (Pondicherry ),a union teritory, neighbour to Tamilnadu, India. Mansa Devi temple is one of the most popular and most visited temples of Haridwar, Uttaranchal. Mansa devi temple is dedicated to Mansa Devi, a form of Shakti (Power). Mini Sabarimala Shree Ayyappa Temple is the first ancient Ayyappa Temple outside Kerala State, situated atop a hillock surrounded by hills and valleys at Kanjur Marg (W), Mumbai. Mukteswara temple bhubaneshwar is dedicated to Lord Shiva, Mukteswara, is carved with figures of ascetics in several poses of meditation. Situated in the heart of the busy Alleppey town,know popularly as the Venice of Kerala, Mullakkal Devi Temple is a unique temple with no roof over the sanctum sanctorum and the diety is exposed to sun and rain. Mumbadevi temple was built in honour of the Goddess Mumbai or goddess mumba devi, from whose name the word 'Mumbai' is derived. Thiruchendur Murugan Temple is temple dedicated to Lord Muruga and one of the Arupadaiveedu (six major abodes) of Lord Muruga. Temple of Lord Nageshwar jyotirling is situated in Gujarat, and is about 12 kms on way from Gomti-Dwarka to Bhet-Dwarka. The jyotirlinga enshrined in the temple of Nagnath is known as Nageshwar Mahadev and attracts thousands of pilgrims all round the year. Naimisaranyam is among the eight swayam vyakhta kshetrams and among the 108 divyadesams of Sri Vaishnavas. The place is also known as Nimkhar or Nimsar and is on the banks of the river Gomati. Naina Devi Temple is one of the fifty-one Shakti Peeths in India. Situated 60 km from Bilaspur district in Himachal Pradesh, Naina Devi Temple is one of the highly venerated Shakti Temples in India. Sri Nanjundeshwara Temple at Nanjangud is one of the ancient temples of Karnataka. The original Nanjundeshwara temple is said to be of Ganga period (325 - 1000 CE). Later, this temple has then been renovated by the Hoysala kings. Vidya Tirtha Sethu : A tunnel Bridge called vidya Tirtha Sethu,connects the two banks of tunga River. this bridge was built by his holiness Abhinava vidya tirtha maha Swamiji. The Chidambaram temple houses the Nataraja (lord Shiva in Ananda Tandava pose; the Cosmic Dance of bliss) statue. It is of great religious, historical and cultural significance. Ahobilam, which is known as Singavel Kundram, is dedicated to Lord Narasimha, the lion form of Lord Vishnu, which he took to kill the demon Hiranyakashyapa. Tiruchanoor, also known as Alamelumangapuram, is about 5 km from Tirupati. The temple of Sri Padmavati Devi, the consort of Lord Sri Venkateshwara is situated here. It is said that a visit to Tirumala is fruitful only after visiting the Sri Padmavati Devi temple. Palani is one popular temple in Tamilnadu dedicated to Lord Muruga and is one of the Aru Padai Veedu shrines of Murugan.Palani (Tiru Avinankudi) is the third Padai Veedu. Pancha linga temple, located at a distance of about 15 km from Chennakeshava temple of Somnathpur, is dedicated to five forms of Lord Shiva. Mangalagiri means The Auspicious Hill. This place is one of the 8 important Mahakshetras (sacred places) in India. Parashurama temple is a very simple affair architecturally. The plan is formed by, a sabhamandap, the easternmost part of the scheme, a central mandap, and a garbhagriha. Parasnath Temple in Bihar is one of the very popular Jain temples in India. It is not too old and the name of the temple, Parasnath temple, has been kept after Parsvanath, the 23rd Tirthankara of Jains who achieved Nirvana here. Parashurameswar Temple, a small but marvelously decorated shrine of Lord Shiva, is assumed to be one of the oldest temples in Bhubaneswar and is constructed in 650 A. D. The temple is a specimen of the architectural styles of Oriyan temples. Saraswathy temple, also known as the Mookambika Temple is situated in North Paruvur a small town in Kerala. It is one of the rare temples dedicated to Goddess Saraswathy (the Goddess for arts and learning) in Kerala. The famous Poornathrayeesa Temple is located at Tripunithura, lying at a distance of about 10 kms to the southeast of Ernakulam. Dotted with a number of temples, Tripunithura is often also referred to as the Land of Temples and the Poornathreyesa Temple is one of them. Raghunath temple has the most beautiful and splendid temple complex in Northern India. This complex consists of 17 temples. This Rajarajeswara Temple is situated at Thaliparambu, 23-km away from Kannur town, on NH 17. The deity is Shiva. The Raja Rani Temple is made from the beautiful red and golden sandstone. The red and golden sandstone is locally known as Rajarani. Thus, the name of the temple is as such. Swami Vivekananda, the great disciple of Shri Ramakrishna Paramahansa wanted a temple to be built incorporating the features of temple architecture of different creeds and religions and that is exactly what has been done. The Ramalingeswara Temple located in Tadparti, Anantapur district of Andhra Pradesh is a well renowned temple. The deity is highly revered by all. Rameshwaram is an island situated in the gulf of manner at the very tip of the Indian peninsula.Rameshwaram Jyotirlinga of Lord Shiva is situated on the peninsular tip Rameshwaram. The Rangaji Temple, is the largest temple in Vrindavan and was built in 1845 by Seth Govind Das. An amalgam of Rajput and South Indian temple architecture, the temple is dedicated to Lord Ranganatha or Rangaji depicted as Lord Vishnu in his Sheshashayi pose, resting on the coils of the sacred Shesha-nag. The Ranganatha Swamy Temple in Srirangapatna enshrines Lord Vishnu as Ranganatha. It is said that the Ganaga chieftain, Tirumalaiya built this temple in 894 AD. The Ranganatha Swamy Temple was later expanded by the Hoysalas, Vijayanagar monarchs, Mysore Wodeyars and Hyder Ali. About 135 Kms from Mangalore and 80 Kms from Udupi, in the valley of Kodachadri peak of Western Ghats nestles a serene town Kollur. Here is seat of very famous Mookambika Temple on the banks of the never drying river Sauparnika The temple is dedicated to Mookambika and stands on a spur of the Kodachadri peak. Shri Devi Shantadurga temple is located at Kavlem in Ponda Taluka. This temple at kavlem is considered as one of the most important temple in Goa. The presiding deity of sheetala devi temple is Mata Sheetala Devi, which is also referred to as Shakti Peeth. Shree Saptshrungi Gad near Nashik city is situated at a distance of 60 km from Nashik.It is one of the most visited and religious places for pilgrims.As the temple is situated on a mountain, a regular bus service is provided from the foot of the mountain to the temple. Mathura, the birth city of Bhagwan Krishna is situated on the banks of river Yamuna and is approximately 145 kms from the capital city Delhi. Mathura is renowned for being host to the most revered temple of Shri Krishna-the famous Krishna Janma Bhoomi Mandir. The presiding deity of Shinganapur, Sri Shaneshwara or Shanidev- the personification of the planet Saturn is worshipped with utmost reverence and devotion by multitudes of people from all over the world. Trichambaram Sree Krishna Temple situates in Taliparamba of Kannur District. Main deity is Sree Krishna after the Kamsavadham . Since Trichambaram Sreekrishna sits in Raudra style (ferocious) it is believed not to worship him during dawn. Ranganthaswamy temple is located at the banks of Penna River, Nellore, which originates from the Tamil word Nelli, means rice and uru means village to total it as a village of paddy fields. Sri Kalahasti temple is located 36 km away from Tirupathi in Chittoor district of Andhra Pradhesh, India. The inner temple is constructed around 5th century and the outer temple was constructed in the 12th Century. Konark Sun Temple dedicated to sun god is situated on the shores of Puri, Orissa. Konark Sun temple was declared a World Heritage Site in 1984 .